A sauce or a condiment can make or break a meal. A disastrous effort can render an otherwise perfect meal inedible, whereas a veritable success could strike a perfect balance with the dish, enhancing and improving any existing flavours. Mayonnaise is one of the most popular condiments currently in existence. It is simple yet so versatile, and in France included as part of the melange of the five 'mother sauces' (meres), or 'grand sauces'. These sauces form the basis for a multitude of other sauces, and mastering just the basics will stand you in good stead when it comes to more experimental cooking. That said, the recipe for mayonnaise might be stunningly simple, but the recipe can be tweaked and altered in almost an infinite number of ways. By adding another simple ingredient such as garlic or Tabasco into the mix, a whole new taste experience can be created. Being so popular, ready-made mayonnaise is commonly available from supermarkets. It tends to be made in its most basic form taste-wise, yet the list of ingredients can be a bit more comprehensive. This is largely because shop-bought mayonnaise is made to last longer than freshly made mayonnaise. The result is that the ingredient list is bursting with preservatives, acids and sugars. When you take into account that mayonnaise is quite fattening anyway, these added extras truly make it an unhealthy option. Some shop-bought mayonnaise brands may also use eggs from battery hens (hens kept in cages). Although there is a move by some of the larger well-known brands to free range eggs, by making your own mayonnaise you can be sure of the exact ingredients. As well as being the ethical choice, free range eggs also tend to be much tastier - ideal for such an egg-based recipe. Fresh homemade mayonnaise can only be stored for a limited number of days - usually a maximum of 5 days in the fridge. When you make your own mayonnaise, the recipe usually includes raw eggs, whereas commercial shop-bought mayonnaise contains pasteurised eggs. Raw eggs carry a small risk of transmitting salmonella. Although salmonella poisoning is not common, the risk means that vulnerable people such as the very young, elderly and pregnant women should ideally avoid raw eggs. 1. Start by separating the egg yolks and place them into a small mixing bowl. A bowl with a narrow base will ensure that the mixture can be mixed evenly. Then add the mustard or mustard powder - the mustard will help to accomplish an emulsified, smooth texture. Then add a pinch to teaspoon of salt and some freshly ground black pepper - depending on your preferences you can add up to one teaspoon of salt in this recipe. 2. You will then need to add a drop of the oil into the mixture and begin whisking. You can opt for a hand balloon whisk or a handheld electric whisk. As you whisk, add all of the oil drop by drop. Although this essential process is initially slow, the mixture will eventually thicken and avoids the mayonnaise turning into a gloopy glutinous lump. Once the mixture starts to thicken, you can then increase the amount of oil you add - usually a thin, steady stream - but too much too soon will cause the mixture to curdle. 3. Once you have added around half the oil, you should then mix in around one tablespoon of white wine vinegar, taking care to evenly whisk the mixture. At this point you can also add more seasoning, depending on your tastes. If you prefer a thinner, less rich mayonnaise you can try adding 2 teaspoons of boiling water into the mixture. 4. 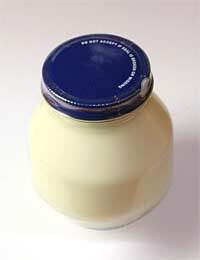 Your homemade mayonnaise can be stored in a sterilised jar in the fridge, and needs to be cooled before it is served. Remember that you should only keep your mayonnaise for around 5 days. Mayonnaise is an excellent accompaniment for fish recipes, boiled eggs or asparagus. For an added twist, why not add one or two cloves of garlic to the recipe to make a traditional French garlic mayonnaise known as 'aioli'.